Andy, you are right that remembering the references can be an important part of our review. Thanks for making and revising your system for this. I have neglected it as I have been focusing on putting up verses for others to memorize. However, I want to add this to my daily commitment. I like how you break every session into 10 quick questions. I commit, Lord willing, to do 2 sessions (20 verses) of reference review every day. Where were you 20 years ago when I first started discovering the immeasurable treasure and life-transforming power of memorizing Scripture to deeply get to know and more fully trust the Living God and found NO help or support like this website anywhere??!! This is just GREAT, Andy! With all the end-of-year Christmas rush I have been getting a bit behind with my memorizations, and it always seems to be the references that I forget, rather than the verses themselves. Now that I have some time on my hands I am going to make the most of this EXCELLENT new feature. I like Phil Walker's idea of doing 2 sessions a day, but I think I'll need to do even more than this initially! I decided to stop at 200 verses for now, till I really REALLY know them all, and I think this new addition to your wonderful website will help me know when I am ready to start on the next hundred! Heather-Kate, great to hear from you and to know that there is Scripture memory going on in New Zealand. I was born and grew up on the mission field in Indonesia, but somehow never made it to New Zealand. Maybe someday. Thanks, Phil. Yes, definitely do come and see NZ some time. You'll love it. I'm leaving this reply at 11.07 pm Monday, NZ time, so I'm writing from the future! Heather-Kate, Lord willing, I will be able to make the trip someday, though it will cost me about 2 days of my life (1 in air travel and 1 in time travel into the future.) Hey, what happened to, "I decided to stop at 200 verses for now, till I really REALLY know them all"?? The evidence seems to point to you already having found the "next 100 verses" worth memorizing and moving towards adding them on. May God richly bless you as you seek to know, love, trust, and serve Him more and more each day. Do you have others there in NZ memorizing Scripture with you? Heather-Kate, Congratulations on hitting 200. Do you have any one verse/passage that you recently memorized that you especially love? BTW I hope that my lame attempt at trying to be a little funny in my last post was not taken the wrong way. If it was, please forgive me. Innocent Harerimana, I say "Praise God" and go for it. I would definately go for a very focused memorizing of at least most of the NT and much of the OT if I was 22 again. Always remember, that getting to know and responding to the living Biblical God is more important than # of verses, and that He wants you to get to know Him even more than you want to. Rely on Him for His power and grace in any dark times in your journey. If it was me, in addition to ACTS - REVELATION, I would go for MATTHEW, JOHN, and the parts of LUKE that are not in MATTHEW and the 20-25 verses in MARK that are not in the other gospels, and use more time finding and memorizing great truths from the OT, rather than memorize every single word from the gospels. Just a thought. You are in my prayers. One of my prayers is that God will bring you others who want to memorize with you for face to face encouragement, accountability, and inspiration. Can I ask what translation you are using? I know of a ton of resources in the NIV that can help you. I found that the audio New Testament was the biggest help in assisting me to memorize large chunks of the NT. Innocent, I find it hard to think of a more worthy goal. There are slightly less than 8000 verses in the new testament (see this link for a breakdown: http://catholic-resources.org/Bible/NT-Statistics-Greek.htm ). If you drop a couple of the Gospels as Phil suggests it's closer to 6000. If you could add about 600 a year I think you could complete that in ten years. You'd probably have to start with adding two per day for the first few years because you will need to spend more time reviewing the ones you know in the second half of the decade. It is definitely a pursuit that you would never regret! Just saw your comment above, Phil. Don't worry, nothing you wrote offended me. I just hadn't looked on the blog for a while. The Lord your God is with you. He is MIGHTY to save. He will take great DELIGHT in you. He will quiet you with his LOVE. He will REJOICE over you with SINGING. I just love the feeling of being so deeply loved by God, even in all my imperfection! Heather-Kate, great to see you back on the memverse blog. You sure picked a great verse in ZEPHANIAH 3:17. If only we could fully accept all the love God has for us and daily rest/rejoice in it. How secure and ready to live for Him we would be!! Do you do all your memorizing in the NIV? (as I do) If so, are you aware of all the incredible memorizing resources there are in the NIV? The Visual Bible DVDs word for word for ACTS and MATTHEW. Quiz Pro Scripture memory software (This year available to help memorize 1 and 2 Corin, 1 and 2 Timothy and Titus), Tons of awesome short and long Scripture songs, etc. Yes, Phil, I almost always use the NIV translation for memorising, unless it is a verse I am used to hearing in another translation in a hymn, or sometimes if I just prefer a different translation. Thank you so much for letting me know about all the resources that are available. I would love to get hold of the scripture songs you mentioned, because I often make up little tunes to help me remember my verses (drives my kids crazy...) I tried to google some of your suggestions, and found all sorts of things, but only general Quiz Pro software, not scripture specific. 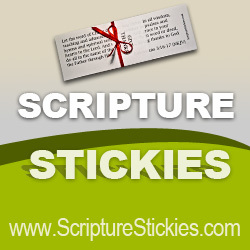 Are there any websites you can suggest for finding scripture songs, or for the Quiz Pro Scripture memory software? I'm thinking that it would be nice if you could have an option to "Reply" to a particular comment and then that person would be notified somehow and then be able to know when someone has answered their question, etc. . . I don't know how feasible those two options are, but I think that would be a nice benefit. I'm just a bit bothered by the amount of unanswered replies(if you catch my meaning) that I'm seeing on the different posts. River, I like your suggestions. We're thinking of a way to allow more people to post directly to the blog (it's currently not possible). We didn't want things to get out of hand and end up spending all our time moderating the blog. My experience is that giving everyone carte blanche to post would very quickly lead to problems. I would love to have some more people blogging, though, so if you're interested, feel free to write an initial blog post and I'll post it up under your name. So long as it is somewhat related to scripture memorization and original, I'm sure it will be ok.
We're also encouraging people to use the 'Feedback' tab (on the right of the screen) for asking specific questions about Memverse, for reporting bugs, and requesting new features. Since there are now hundreds of people using the website every day, we're past the limit where one person can answer everyone's questions if they email us directly. The feedback website has multiple people who can answer questions and I always respond to the questions there first before I tackle the ones in my email inbox. The blog was originally intended as a way for us to communicate with users about new features and to give the Google Crawler and idea of what the website is about. We've always planned to add more of a community feel as the website grows (a year ago there were only about ten of us around!). We're trying to avoid re-inventing the wheel and recreating a mini social network here on Memverse and the course will probably be to add more Facebook functionality into Memverse. We have a broad demographic that spans 8-year-old children all the way up to 88-year-old youngsters so it's a challenge to figure out the best way. While some people are completely comfortable on a social network, others are troubled by getting email from people they can't put a face to. I'm actually somewhere in the middle :) But we are thinking about it. I have a humorous error to report. On the Reference Recall Results page, one of the sentences has a typo. It says: Your previous reference accuracy score score was 83%.